"We demand that the IEBC chairperson announce the presidential election results forthwith and declare Raila Amolo Odinga... as the duly elected president." Kenya's opposition National Super Alliance (NASA) leader, Musalia Mudavadi said this while rejecting the results that showed opposition Raila Odinga trailing incumbent Uhuru Kenyatta in a fraught election that has sent jitters through the east African nation. 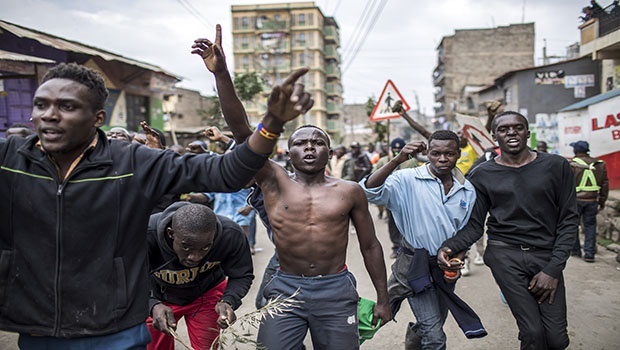 Celebrations erupted in opposition strongholds that have also seen angry protests over Odinga's rigging claims, which sparked a gloomy sense of deja vu in a country that witnessed disputed polls in 2007 and 2013. Britain and the US joined foreign observer missions from the European Union, African Union, Commonwealth and the Carter Center in urging party leaders to be patient and refrain from inflaming tensions ahead of the release of final results, expected on Friday. But the opposition National Super Alliance (NASA) doubled down on accusations the counting process was a "sham" after Odinga claimed Wednesday that hackers broke into the electronic tallying system and manipulated results. One of NASA's leaders Musalia Mudavadi provided documents purportedly obtained from the servers of the electoral commission (IEBC) via a "confidential source" showing that Odinga had 8.04 million votes, leading Kenyatta on 7.75 million. This was despite the fact that results streaming onto the IEBC website showed Kenyatta with 8.1 million votes to Odinga's 6.7 million.